Cross Country Rally is probably the most accessible car racing category. No tricky cold tires & brakes to warm up, no door-to-door fighting, no trees around you just open space, reasonable top speed, just the pleasure of gliding at your own rhythm in a wonderful countryside with the added value of a 3rd dimension thanks to the jumps. Cross County Rally is a mix between karting and a secure motocross, well … with Dunbee at least. [ 2 days ] A Baja is a Cross Country Rally which lasts no more than 2 days. Most of the time they are composed of loops around an assistance point which gives everyone the opportunity to improve their performance and car handling. The format of a Baja is ideal for a gentleman driver working all week who wants to have maximum driving time (up to 600 km per day!). Every year there are more Bajas organized in Europe, Middle-East, and Eastern Countries, mainly near large cities with all the facilities required (airport, hotel). [ 8 days max ] A basic Cross Country Raid is a Rally which lasts not more than 8 days with a total distance between 1200 and 3000 km. A good mix between racing and adventure in some spectacular scenery. An occasion to discover the visited countries and their local population. [ 8 days min ] A Marathon is a Rally of which the itinerary may cover the territory of several countries. The total distance must be greater than 5.000 km with a total duration of up to 21 days. 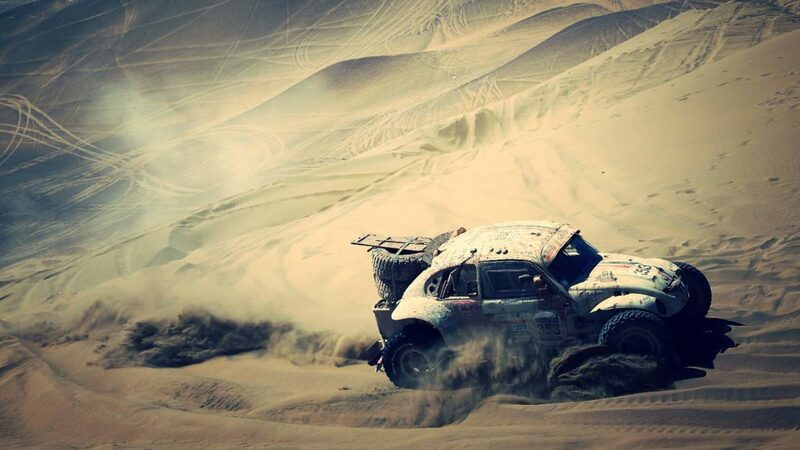 The most famous Marathon is the Dakar now held in Argentina. But you can also choose the Africa Eco Race, the Silk Way Rally, the China Grand Rally and many other opportunities to find your own personal limits in a real human and sportive adventure.